The Seniors Card is a free card providing transport concessions and participating business discounts on a range of goods and services. To be eligible you must be a resident of the Territory, 60 years of age or over, and not working more than a set numbers of hours per week in paid employment. COTA is utilising a number of channels to deliver the NT Seniors Card program including print, digital and face-to-face communications. 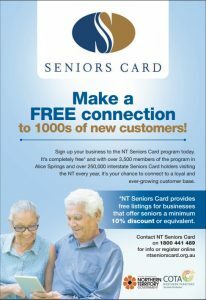 The first edition of the NT Seniors Card printed discount directory was published in April 2018. The second edition – with over 100 additional businesses – is due for publication in April 2019. The Seniors Card program is regularly promoted through advertisements and articles in the press (NT News and the Centralian Advocate) and via contributions in 3rd party newsletters (such as Probus and PRBA). Details of new businesses, Seniors Card events and other senior-specific news are posted on the NT Seniors Card Facebook page (@ntseniorscard). Staff and volunteers meet with members of the public and business community to talk about the benefits of the NT Seniors Card program. Dates are posted on the NT Seniors Card Facebook and COTA NT Facebook pages.